After some research, I have concluded that the 2-inch-long red pepper I inadvisably consumed in a single bite was probably the much-feared Habanero. It did, indeed, feel as though the lid of my skull was lifting away from my brain. Mike, That was no habanero. The color is wrong. The shape is wrong. 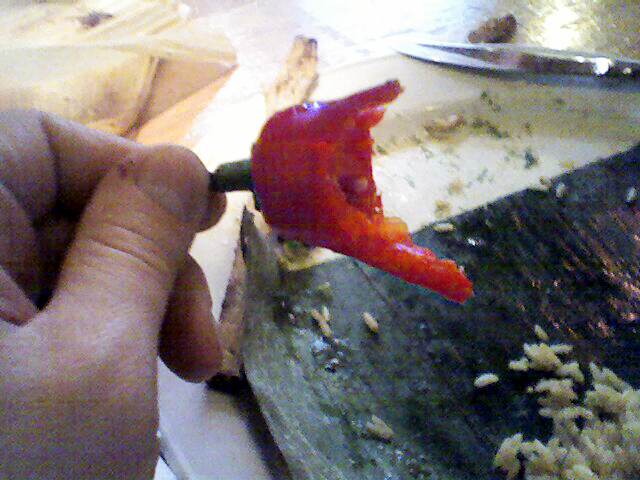 I suspect that it was a very strong jalapeno. That feeling of your skull coming apart is a symptom. The Mexicans have a word for it: “Enchilidada” – overcome by chilis. I once got into a sort of chili duel at a Tibetan restaurant. Every time I went there for lunch, the owner would ask me, “Was it hot enough last time?” and I would tell him that I could handle it hotter. One day he asked, “Would you like it made what we would call hot?” The cook brought my food personally. He wanted to see me eat it. Just a few bites and I began to sweat. Then I had that head separation feeling. Then my vision began to narrow. I started hearing hissing noises, but weirder still, I started hearing people talking quietly behind the hissing. I finished dinner and the cook asked me if it was hot enough. I gasped out a “yes” and had to go back to work. The tunnel vision did not clear up for about twenty minutes. It was an extrememly cool buzz, but not for chili beginners. I’ve also had endorphin rushes from very hot chilis on an empty stomach. It is ususally wise to eat something right quick. I finally got a Vulgar Boatmen CD from emusic.